For the first time, I attended the 3-day West Coast Ragtime Festival (2018) in Rancho Cordova, near Sacramento, California. It was about time, as I’ve been playing ragtime since high school and thinking about the festival for several years. I spent about 3 solid days writing Sinky O, an original ragtime piece. I hoped to perform it during one of the few “open piano” sessions at the festival, which I did, but only a couple people were present and I did a lot of messing up. There are some rough edges in the piece. The ending is sudden and the minor section is a little limited and repetitive. I may work on it some more. The name is a play on the term “cinquillo,” which is one of three Spanish rhythms along with the tresillo and habanera. Cinquillo denotes a particular rhythm consisting of: 8th, 16th, 8th, 16th, 8th. Jelly Roll Morton’s works were influenced by Spanish music; he added what he referred to as the “Spanish Tinge”. Some ragtimes (e.g. Solace) were written using habanera. 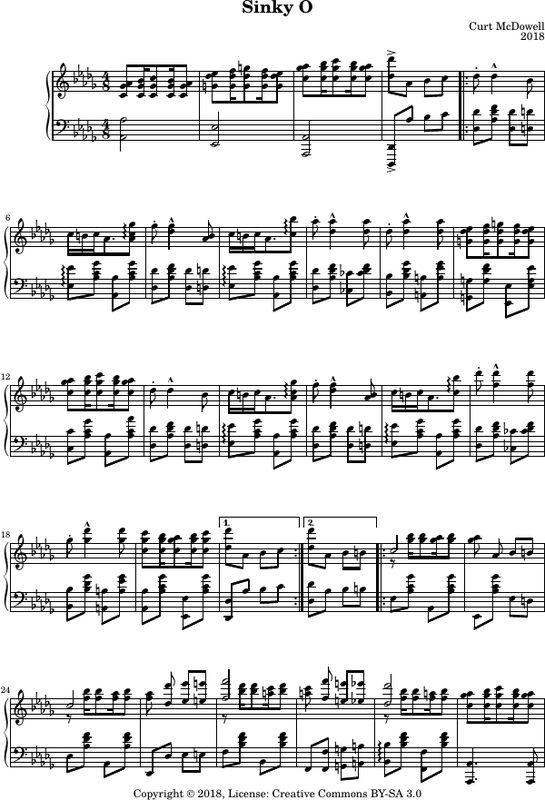 The recommended tempo is 200 to the 8th note (duration 3:00).